My interest in East of West has had peaks and troughs; just when I am confused and getting a bit bored with it, Hickman and Dragotta knock it out of the park. Lately they've been hitting more than missing with some really fantastic issues–the mythology they are slowly building and the unique mix of manga and western style art manage to make it one of Image's best, one of our nominees for best series of 2014 at the Comics Rexies. 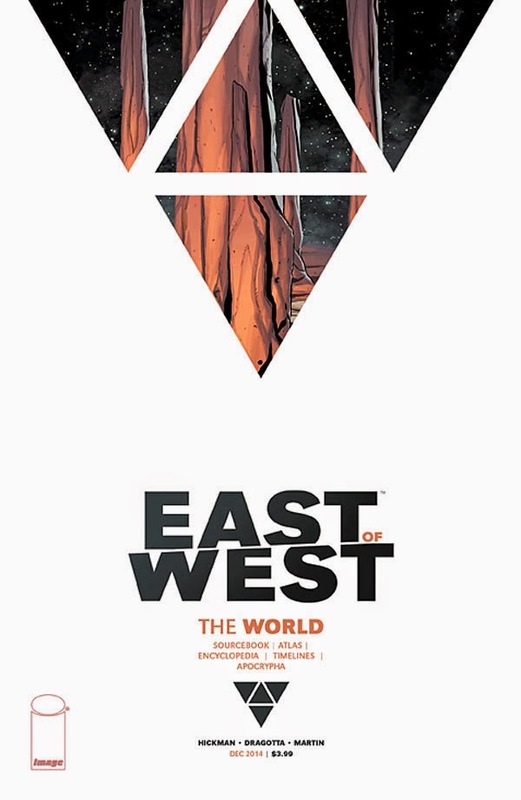 Tomorrow sees the release of East of West: The World, a one-shot that seeks to clear up some of that fog surrounding the history of this world they have built. The issue starts with a short story about the horseman trying to find a suitable ride for the one that recently lost a leg. While short, it's less obtuse than some previous issues, and establishes a good baseline for how these horsemen view humanity–with amusement at very best, brutal disdain at the worst. 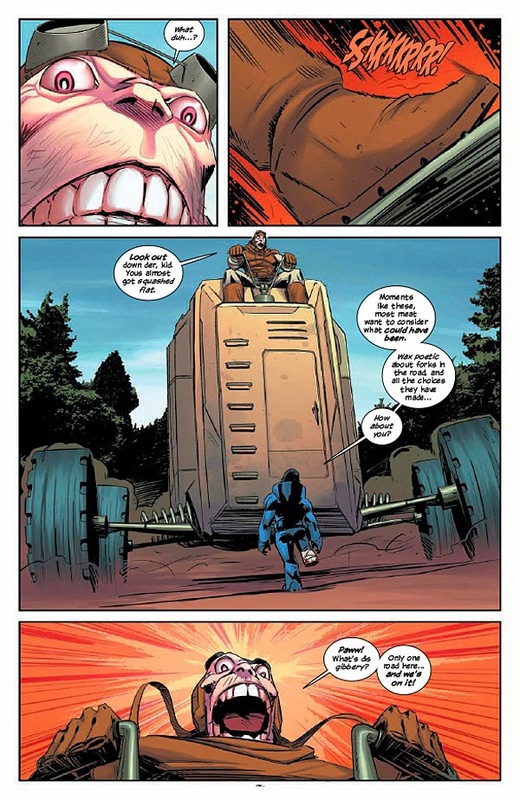 Where we really get to the meat of the issue, however, is in the encyclopedic entries about the independent nations that make up America in the world of East of West. These are much like the fascinating historical entries that Rucka pens in the back matter of Lazarus, but getting them all together in this format really works. We learn about the fallen state of Texas, the state of turmoil in the Union, the mysterious and hyper-technologically advanced Endless Nation, and more. It really fills in a lot of the gaps only hinted at, giving you a great overview of this alternate history while leaving plenty of enigmatic bits to look forward to. Lastly, there is a really fantastic timeline that spans 8 gorgeous pages. If you've ever read a Hickman book, you know he's got a great eye for graphic design, and this issue really shows it off. Readers are able to easily follow along and see when nation states split, were conquered, and fought wars, but the the simple and impactful visual is what really sells it–I would totally buy this as a poster. So is this worth your time, as an issue with very little story? Absolutely. It goes without saying that fans of the series will like it best, but frankly this is a great way to test the waters before buying the first trade. You'll get six full pages of Dragotta's excellent art, plus a history of this world that doesn't drag–I found myself getting really engrossed despite the fact that this isn't a story in the traditional sense. Perhaps most importantly though, you're getting a 40 page comic for $3.99. How often can you say that?